In my Farrow Dress post I mentioned an adjustment I use to make a sleeve piece wider without altering the length of the sleeve cap seamline OR altering the bodice pieces. This can disrupt the fit of the bodice, however, not good. Or, by lowering the armhole to add more overall length to match the sleeve seamline. This can actually reduce your range of motion – also not good. Instead, I use a different method that works on SOME pattern styles. This method widens the bicep area, widens the upper arm area of the sleeve cap, and lowers the top of the sleeve cap. Lowering a sleeve cap has the added benefit of giving your arm more range of motion BUT there’s a caveat – if you lower it too much you’ll start getting fabric bunching under your arms. You need to find a balance that works for you! Because of this, this method works best on a sleeve piece that has a TALL sleeve cap because if your original sleeve cap is short to begin with, you may experience the “bunching” side effect. 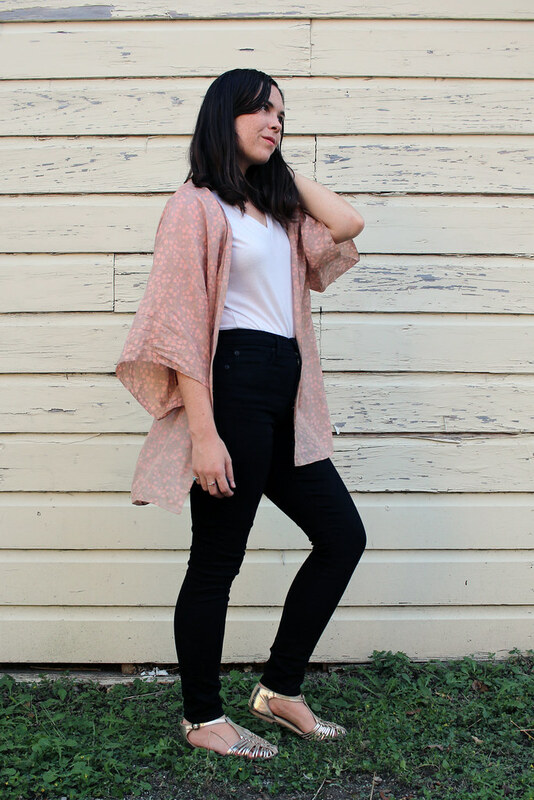 Ikat Bag has an excellent blog post all about sleeves. Cannot recommend this post highly enough! Check out the “box” section for details on how different sleeve cap heights function in real life. Trace your original sleeve piece. You may want to trace without seam allowances to make this easier. If you leave the SA on, be sure to include it in your measurement calculations! Measure the length of the sleeve cap itself. Make note of this number. Measure your bicep and compare it to the width of the sleeve. You want 1-2″ inches of ease depending on the type of fabric. For example, on my Farrow Dress, my bicep measurement was the exact same as the sleeve measurement. I knew that would be too tight so I decided to add 1.25″ in total width. Whatever width you choose to add, divide that measurement in half. So if it’s 1″ – divide by half to equal 0.5″. Widen both sides of the bicep area (right below the sleeve cap) by your half-measurement from Step 2. You can widen all the way to the hem or grade to the original hem. Measure down from the shoulder point about a half inch (or more or less depending on the height of the sleeve cap, this is more of an art than an exact science) and re-draw the very top of the sleeve cap curve. Here’s where the measuring tape/flexible ruler comes into play. You want to maintain the original length of the sleeve cap seamline. Widening the bicep made it longer but lowering the shoulder point made it shorter. This should even out the differences in length adjustments. Use the tape/ruler to draw a new sleeve cap seamline by connecting the underarm points to the shoulder point. You’ll notice the sides of the cap itself will end up wider than on the original sleeve. This will also give you a little extra width in your upper arm area. Bonus points! Transfer markings (and add back seam allowance if you removed it earlier) and cut out the new sleeve piece. Don’t forget to label your new piece with all your adjustments! If you measured correctly, your sleeve cap seamline length should be the same as the original but the shape will be different. The sleeve cap is lower and wider than the original. The overall width of the sleeve is increased. You now have more space for your arms as well as slightly increased range of motion. All without any adjustments to the bodice! This method may not be the best choice for all sleeve patterns but it’s one option you can use to get a better fit. A couple years ago Miss Lulu nicely gifted me half a vintage silk sari. That was about 3+ yards! What to do with such a lovely lightweight, semi-sheer silk? 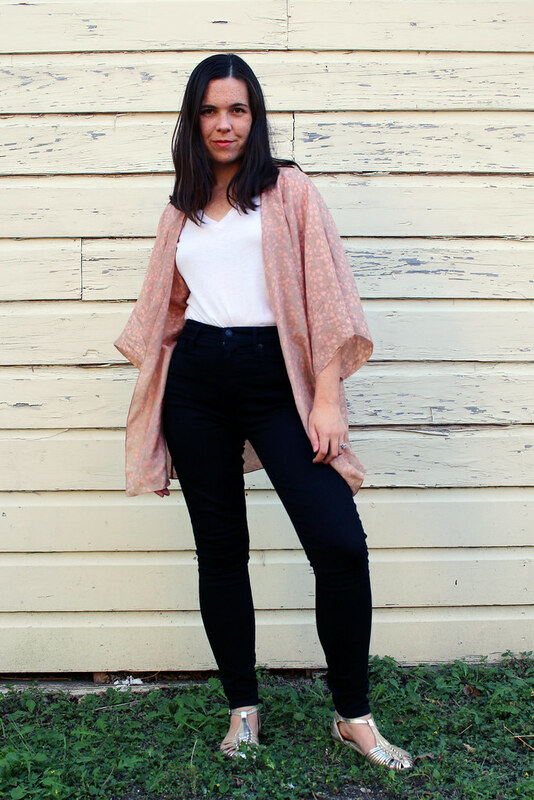 Why not make a kimono? 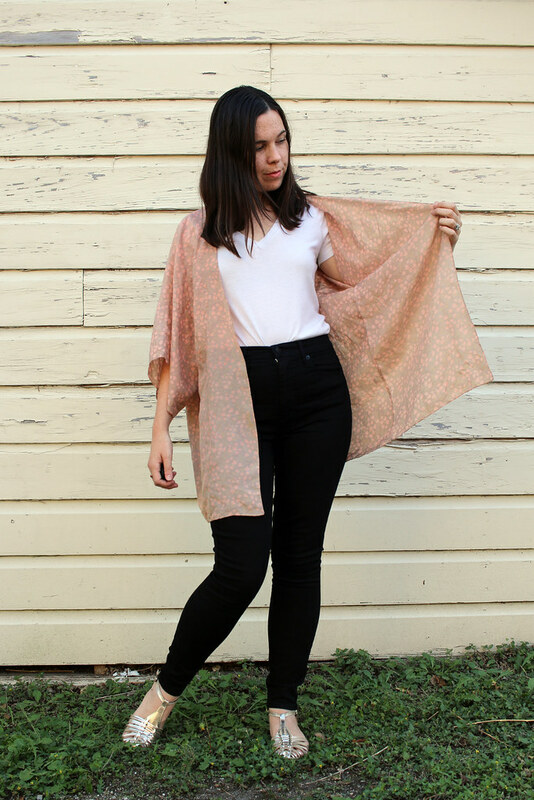 This fabric was perfect for a kimono as it’s so light that it easily catches the wind while you walk, making for a breezy, bohemian look. 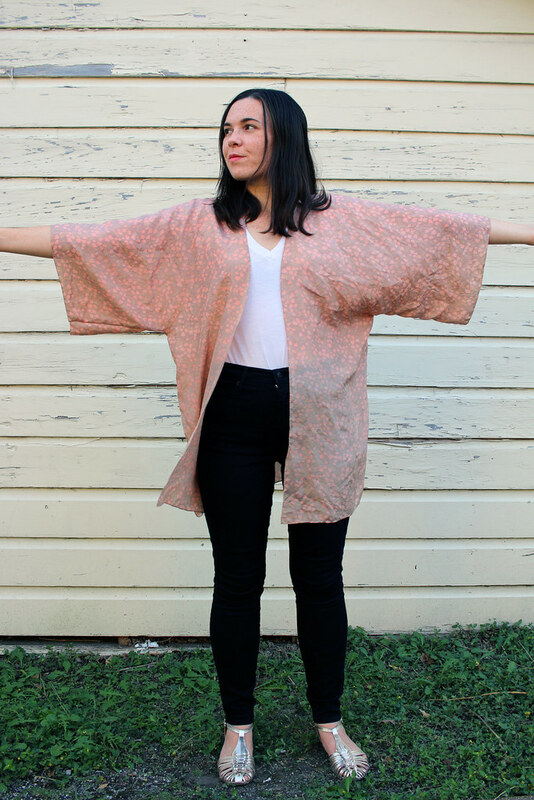 This kimono is super easy because it has cut on sleeves, minimizing the amount of sewing. Because the silk is so fine I French seamed the two sleeve/side seams and hand rolled the hem all around the sleeves, hem and neckline. That was a lot of hand rolling! But the result is so nice. My fabric was 50in wide and long that I was able to avoid having a shoulder seam. 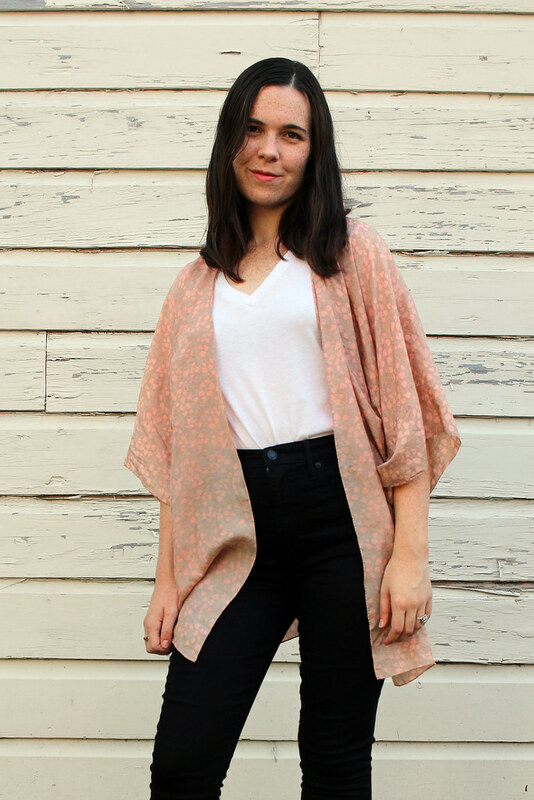 I simply folded the fabric at the shoulder, but this tutorial is going to assume you’ll need two layers of fabric and a shoulder seam. 1. Length from back of the neck to where you want your hem to be. 2. Length from back of the neck to about mid-forearm x 2. 3. Circumference on the widest part of your bicep. Cut two rectangles the length of Measurement 1 and the width of Measurement 2. 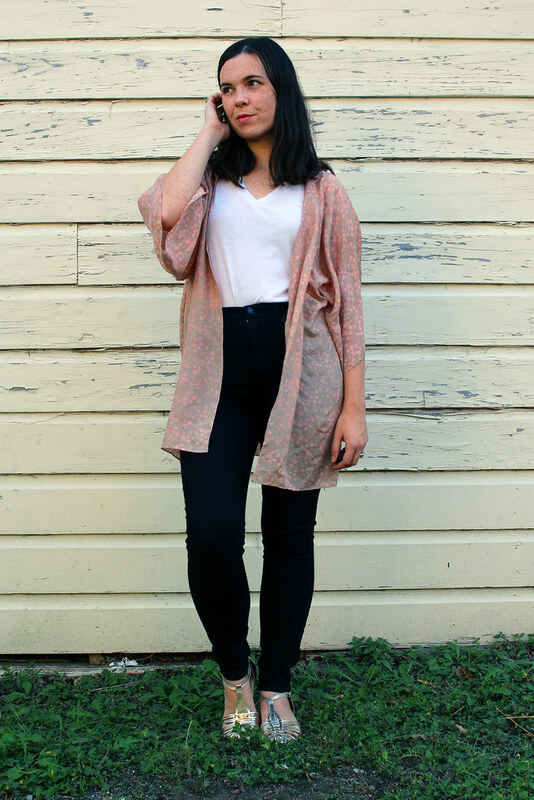 On both fabric pieces, measure the body of the kimono like the image below. Mark the center front/back. On both pieces, curve the underarm seams slightly. On the back piece, curve the center back at the neckline about 8in wide. On the front piece, draw a sloping line from the side of the neck to the center front at the hem. Cut the fabric along the pink lines. Hem the sleeves, bottom edge, neckline, and center front with a narrow hem/rolled hem. Ooooh look, I made a petticoat! Ruffly petticoats aren’t something we see much of these days. They’re usually only worn with special occasion dresses. Sometimes a pretty party dress will come with a layer of tulle attached to the skirt lining but not much else. 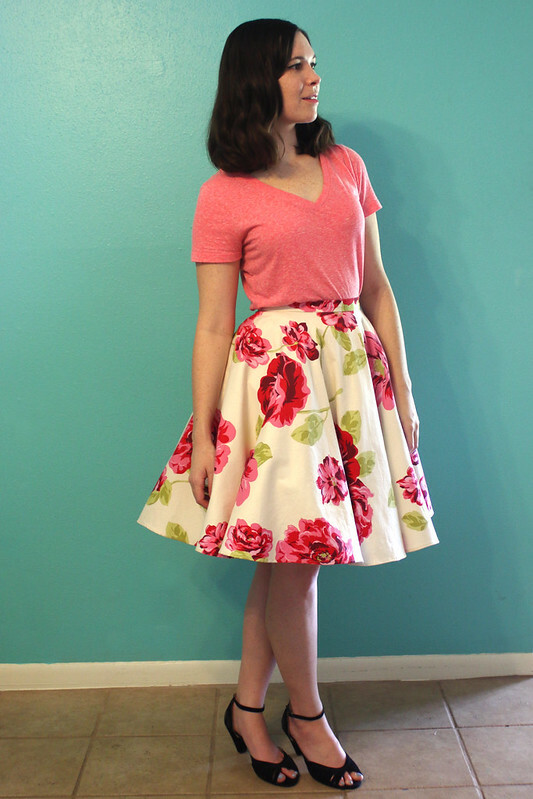 I talked about the current popularity of the Fit and Flare dress in my last post, but those dresses don’t often get the kind of “flare” in the skirt like they did in the 50s and 60s. Why not give the flare some extra oomph with a crinoline petticoat!?? I’m wearing this petticoat with my floral circle skirt. It also works well under other types of full skirts. 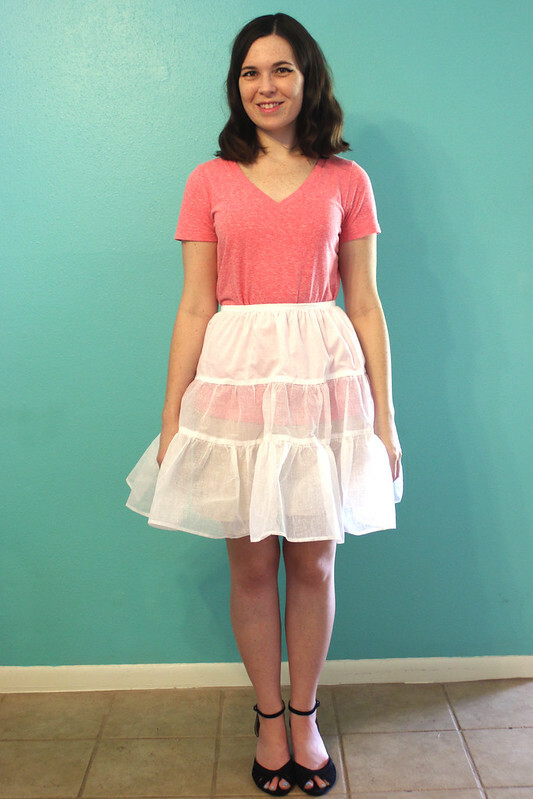 I originally followed this great tutorial but I made my petticoat a little different. Firstly, I didn’t use ribbon trim. Spools tend to come in something like 3yd lengths and I didn’t want to buy 5 spools for one petticoat. Also, that tutorial uses quite a bit of fray check for the raw edges, but since I used cotton crinoline rather than nylon I didn’t need the fray check and simply finished my seams with a zig-zag stitch. Crinoline is a stiff but flexible fabric with a very open, plain weave. You can find 100% cotton as well as poly and nylon versions. It is most often white but you might be able to find it in black. How is Crinoline different than tulle? Tulle typically is made of nylon and has a diamond weave so it doesn’t fray. The size of the net can vary but it doesn’t have as much stiffness or body as crinoline. My petticoat made of crinoline will stand up on its own, tulle won’t do that. Crinoline is mainly for structure so it isn’t “pretty” like tulle. Those fancy colorful petticoats that are made to peek out from under skirts are tulle. 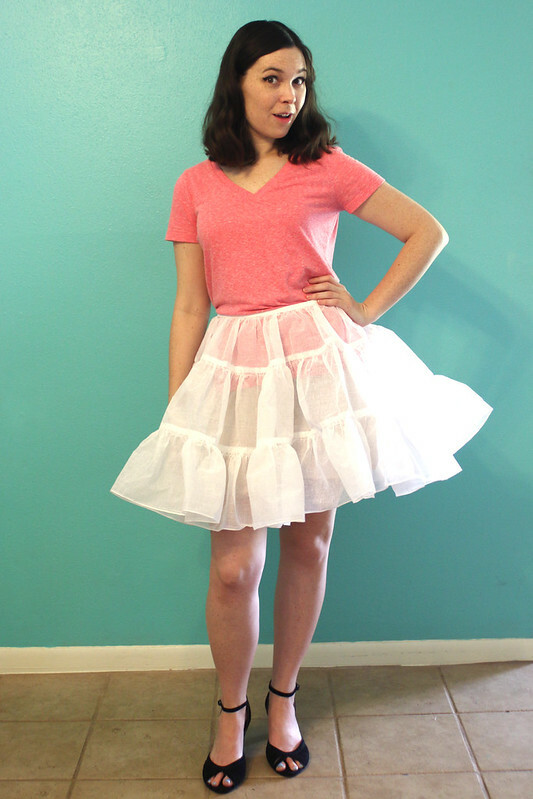 You can use tulle with this tutorial but your petticoat won’t be nearly as poofy. You’ll need several more layers of tulle to achieve a similar effect. Sewing Machine, thread, pins, needles, scissors, etc. Tip: For this tutorial I’ll refer to Crinoline as the fabric and Petticoat as the garment. Use your tape measure to measure from your waist to the hem of the petticoat. Tip: The petticoat should be 1″-2″ shorter than the skirt you will wear it with. My petticoat length is 20″. Divide that measurement by 3 for a 3 tiered petticoat. I made my tiers 6″ (top), 7″ (middle), and 7″ (bottom). Bottom: 7.5″ (7″ plus .5″ seam allowance at the upper edge) x 8yds (two 4yd pieces). Tip: I cut my bottom tier along the selvage so I wouldn’t have to hem the lower edge. Tip: My waist measurement is ~26″. If your waist is ~40″ or larger, consider cutting longer tier lengths like 3yds for the top, 5yds for the middle, and 9yds for the bottom tier. For the bottom tier, stitch the two 4yd pieces together along the short sides using a 1/2″ seam allowance. Finish the seam allowance with a zig-zag or overlock stitch. Repeat with the middle tier. For the top tier, hem both of the short ends by folding the raw edge inward 1/4″, then fold it over again 1/4″ and top stitch. 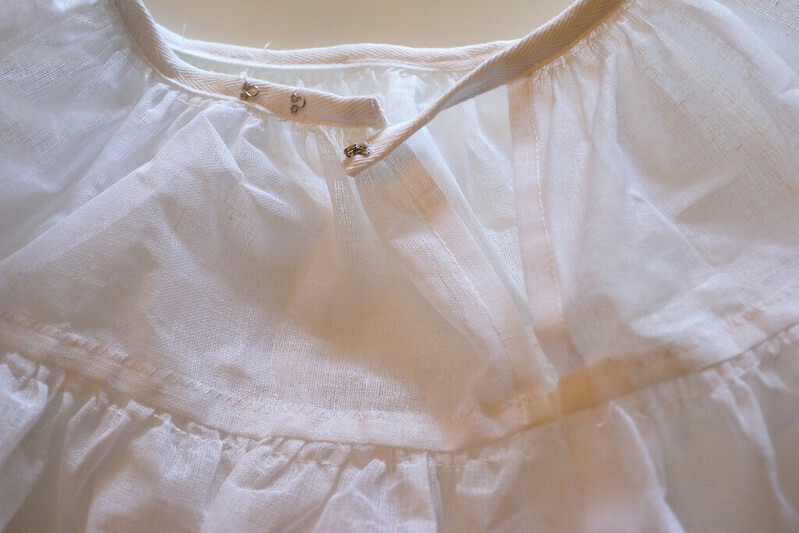 This part will be open so you can get in an out of the petticoat. Lower your machine tension slightly and use a long machine stitch. Sew two lines of stitching on each tier, one at 3/8″ from the upper edge and again 5/8″ from the upper edge. Tip: For the bottom tier, start and stop your gathering stitches at the short side seams rather than stitching all around in one continuous loop. It’s easier to gather 4yds than a huge 8yd piece all at once. Divide the length of each tier into four equal parts and mark with pins. You could also lightly iron vertical folds into the crinoline to mark each section. Starting with the bottom tier, pull the two thread tails on the right side of the fabric to gather the crinoline. Once gathered, pin the upper edge of the bottom tier to the lower edge of the middle tier, right sides together. Match up each pin/fold in the fabric so the gathers will be evenly distributed. 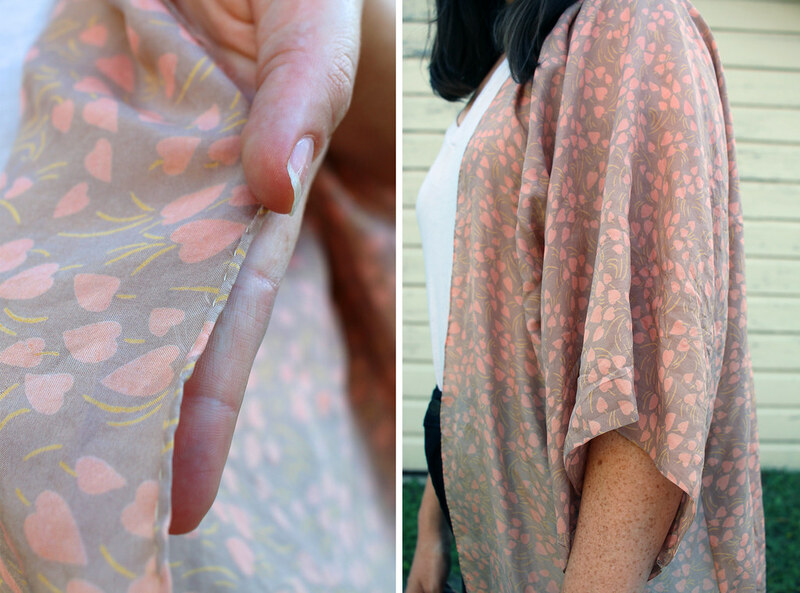 Stitch all the way around with a 1/2″ seam allowance. Press the seam allowance toward the upper tier and topstitch with a zig-zag stitch to prevent fraying. Repeat with the middle tier, then top tier. Cut a length of twill tape that matches your waist measurement + a few inches extra. My waist measurement is about 26″ so my tape is about 29″ long. Mark the length of your waist measurement with a pin on the tape. Those extra few inches will be overlap for the hooks and eyes. Gather up the top tier to fit the waist measurement area of the twill tape. Fold the short sides of the twill tape under 1/4″. Wrap the twill tape over the raw gathered edge of the top tier leaving the overlap hanging off one side. Pin. Stitch close to the edge of the twill tape and be sure to catch all three layers as you sew. Continue stitching all the way until to reach the end of the overlap, backstitch. 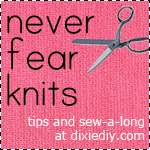 Sew a “hook” to the inside end of the overlap. On the opposite side of the waistband, sew on corresponding “eyes” each about an inch apart. 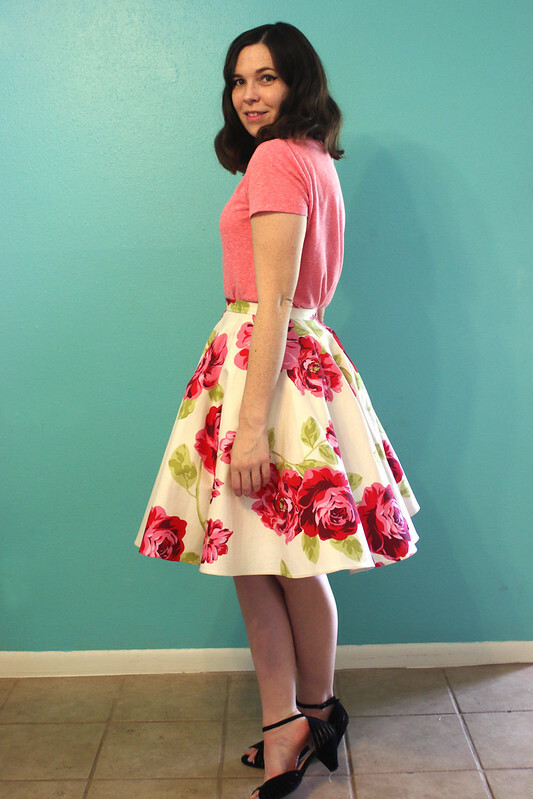 Tip: sewing on extra “eyes” allows you to wear the petticoat lower on your hips when wearing longer skirts. Yay! You made a petticoat! No go wear your skirts extra poofy! My crinoline was only 38″ wide but I had enough fabric left over to eek out a smaller petticoat. This one used 4yds of 8″ wide crinoline for the bottom tier, 2yds of 6.5″ wide crinoline for the middle tier, and 45″ x 7″ of cotton muslin for the top tier. I didn’t have enough twill tape left so I just cut another strip of muslin for the waistband. Here’s an example of my Breathless dress with no petticoat, small petticoat, and large petticoat. I didn’t take a pic of me wearing both petticoats together but, man, it makes for a huge skirt! I was talking to my Aunt about her experience wearing petticoats in the 50s. She said girls would compete to see how many petticoats they could pile up under their skirts. She’d also dip her petticoats in liquid starch to make them extra stiff. If you were around in the hey-day of petticoat-wearing I’d love to hear your stories! Wow, Sewing Indie Month is officially over. Yesterday was the last day of blog touring and tutorials but you still have a few more days to enter some of the fun contests and possibly win one of many great prize packs. 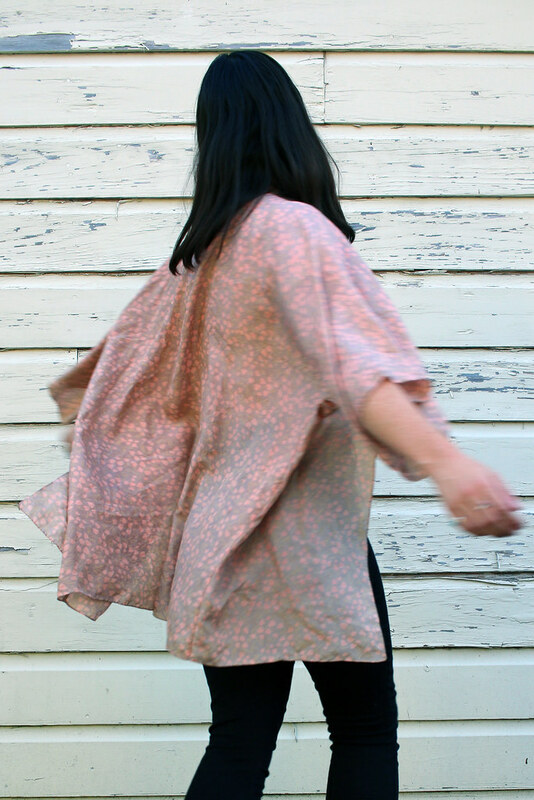 My Onyx Shirt Hack Tutorial is up on Paprika Patterns for you to check out. It’s a double layered version of the shirt with a lace ruffle added at the hem. On that post I mostly talked about the tutorial instructions so I thought I’d do a short post here on the details of the shirt itself. The Fabric: I was surprised to find this 100% rayon challis print at Joann Fabrics of all places. This was stuck up with the “silky” fabrics which is just a nice way of saying “shiny polyester.” Luckily I checked the bolt end and was pleasantly surprised. Rayon was perfect for this project ’cause it’s so drapey and relaxed. The lining fabric is a white rayon challis leftover from an old project. The crochet lace at the lining’s hem also came from Joann. I don’t often include trim in my sewing so I’m glad I found a reason to use it. For the hem of the outer layer I did a blind hem by hand. I didn’t want a line of visible stitching distracting from the lace. The pattern itself includes sleeve cuffs and cute little epaulets but I decided to leave those off to keep the focus on the lace. I tried something new on the sleeve hems, though – a hand rolled hem. It’s a technique I started using on my historical costumes. It makes a truly tiny hem with the added bonus of having almost no visible stitching. It’s usually reserved for very lightweight fabrics like chiffon. This tutorial is a good example of the method I used. Since the shirt had a lining I didn’t need to use bias tape on the neckline but I appreciated the series of tips included in the pattern instructions on making nice, flat, bias facings. I did a couple other changes to the assembly but the instructions were very clear and the illustrations helpful. The Results: This is a great shirt! It’s already in heavy wardrobe rotation. The only thing I wish I had done differently would be to center the stripe pattern, something I didn’t notice when cutting out the fabric. I did a good job of matching stripes at the side seams but I wish I would have lined up the triangles and shapes within those stripes evenly. Oh well, I doubt anyone else will notice. Go read the full tutorial over at PaprikaPatterns.com!